Detail from the font that was removed by the Roundheads in 1643 when ransacking St Mary's church. Found in 2009 beneath floor boards on the 1st floor of a 17th Century Grade II listed cottage in The Shallows, Saltford, this pewter mount might have been used to decorate a book or a strap of the 16th or 17th century. Found by Clive and Cath Munns. These lead musket balls found NE of Avon Farm on the north side of Saltford could be from the English Civil War period (1642 - 1651) or up to early 19th Century. Found by Dave Brennan in 2014. These lead musket balls found on the north side of Saltford could be from the English Civil War period (1642 - 1651) or up to early 19th Century. Found by Bob Mordle in 2015 and 2016. 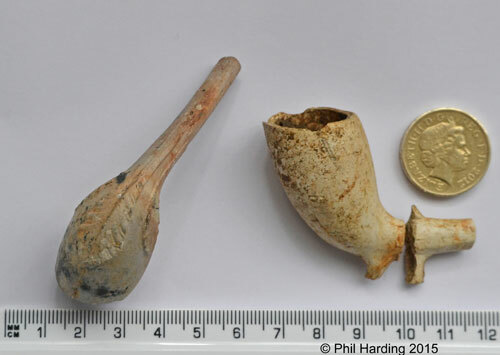 These two clay pipes were found in fields on the north side of Saltford in 2014. They are difficult to date but were in use in England from around the early 17th Century to the late 19th Century. 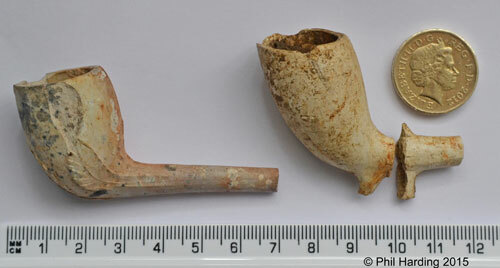 Traditionally, clay pipes were un-glazed. Clay pipes burn "hot" in comparison to other types of pipes, so they were often difficult for most pipe-smokers to use, hence they had long stems (that easily broke). Proponents claim that, unlike other materials, a well-made clay pipe gives a "pure" smoke with no flavour addition from the pipe bowl. It is said that after the Battle of Lansdowne (on the outskirts of Bath) in 1643, a party of Roundheads pursued a group of Royalists across the ford in Saltford, but lost them in the woods around Stantonbury Hill. Stantonbury Hill is to the south of Saltford and is the site of an Iron Age hillfort near Stanton Prior, Marksbury. On returning and finding that they were unable to re-cross the ford, as the tide had risen, they vented their anger on St Mary's church. They found some fine stained glass in the chancel window and in the south windows of the nave. This they completely smashed, defaced and removed the font, and even ripped up some of the paving stones. The damage to the chancel was so extensive that restoration was impossible at the time. The chancel arch was walled up and the nave only used for a while. The Rector at the time was taken away by the Roundheads and not seen again. The unique font, with eight angel heads, is Norman or perhaps even Anglo-Saxon. As described above it was removed by Roundhead soldiers during the civil war and used as a cattle trough. 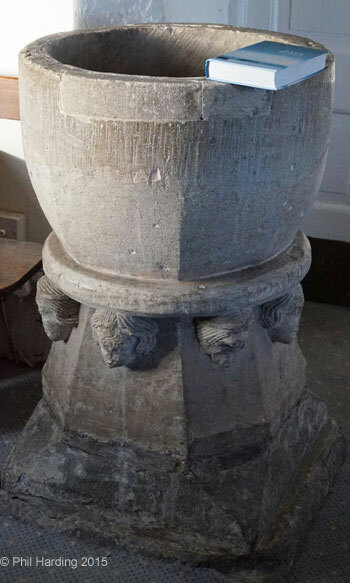 The font was eventually returned to the church and mounted on a new base. William III Half Crown, 1694-1699. Minted in London. Found in Beech Road in the 1950s by Mr E B (Bert) Cox whilst digging his garden. Reverse description: Four crowned shields around lion rampant. Reverse inscription: REX 16 [..] MAG BR FRA ET HIB. 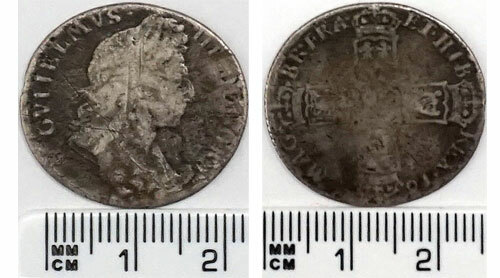 SEG has photographed the coin (the image you see) and the British Museum has used our information and photographs to authenticate and log the coin on its Portable Antiquities Scheme online database: https://finds.org.uk/database/artefacts/record/id/713546. 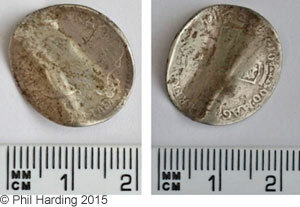 1694-1702 William III Silver Sixpence - "Love Token"
This bent silver sixpence, a "Love Token", was found on the north side of Saltford in 2015. The giving of an altered coin as a token of love is an ancient custom in the United Kingdom going back to the 15th Century. These love tokens were often coins that had been bent twice so they could no longer be used as money and were given as charms to prospective lovers. The coins were usually smoothed down, to almost remove the monarch's head, and then bent. Sometimes they would be engraved with initials or love signs such as a heart or knot. Found by Bob Mordle in 2015.